The current FMF logo, introduced in November 2015, represents Morgan’s long-term imprisonment, but also hope that she can still get free from the confines of a concrete tank. 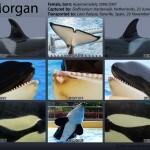 Within weeks of Morgan being captured by the Dolfinarium Harderwijk, a number of concerned citizens and scientists had formulated the basis for what would become the Free Morgan Foundation (FMF). It has evolved into the powerful and publicly endorsed NGO (Non-Governmental Organisation). As of November 2015, there were more than 23,000 people following Morgan on facebook and nearly 7,000 following her on twitter. The name for the Free Morgan Foundation is based on the famous ‘Free Willy‘ movie about an orca that languished in a horrific situation, like Morgan does. In the movie, ‘Willy’ (the stage name of Keiko the orca), was released back into the ocean. 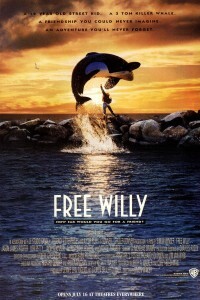 In the real world, the ‘Free Willy Foundation’ was formed, to help Keiko himself be returned to the wild. Keiko had a long journey to return to the ocean, taking years. But during that process he inspired millions of people to care about the ocean and orca in particular. His legacy remains, his message was powerful and remains very poignant given Morgan’s situation now. It is only fitting that the Free Morgan Foundation’s name reflect’s the hope and steps forward that the Free Willy Foundation created. During the process of growth and development of the FMF, and as Morgan’s plight continues to worsen, the FMF has utilized different logos. Our current logo (designed with help from one of our supporters, Lee Harrison) retains elements of the logo which was used between September 2011 and October 2015 (see below), such as the circle to represent captivity and the font to remind us of the history of her campaign). Morgan’s right eye patch and mouth gape, showing her unique pigmentation. However, the current logo, introduced in November 2015, now shows Morgan’s head and ‘face’ – with a replica of her right eye patch, duplicated from a photograph. It also depicts the distinctive pigmentation around her ‘gape’ (the corner of her mouth). As the pigmentation on every orca in the world is unique, we wanted to ensure that the FMF logo represented Morgan as an individual. You can see just how different her left and right eye patches are as well as see the rest of her pigmentation on Morgan’s ID Chart. The FMF was officially registered in September 2011, in the Netherlands, after Morgan had already been held captive 14 months. 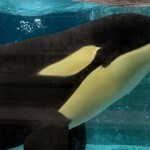 Now, tragically, it has been more than more than five years that Morgan has been wrongfully imprisoned in concrete tanks. This is why the FMF logo now shows prison-like bars. However, we still have hope for Morgan. That hope is portrayed in the logo by the fact that her face is partially free from the bars, to represent the freedom from a concrete tank that we hope Morgan will once again experience. The next iteration of a logo for Morgan was implemented when the FMF was officially registered in September 2011. Designed by one of our supporters, Julia Kuivenhoven, it portrayed Morgan’s stylized tail in a dive as if she was diving into the deep ocean. However, her captivity was symbolized by the circle that enclosed her, but with an opening to represent her chance of freedom. Perhaps the small opening foretold of the small chance that she had against the heavy weights of the captivity industry, such as SeaWorld Entertainment, Inc., and of the value of money, as described in the Spiegl and Visser (2015) white paper about ‘whale laundering’. When the Free Morgan campaign was first formed in 2010, just weeks after her capture, the logo used a small glass to represent the disgustingly small tank that Dolfinarium Harderwijk insisted that Morgan be kept in. She was held there despite the fact that they could have given her more space. The veterinarian Niels van Elk later admitted in Court that Morgan could be (and would be) given more space. But this never happened, as they were clearly worried that she might acquire genital herpes from the dolphins in the adjoining tanks – as this is an infectious disease. However, they still could have given Morgan more space by moving the dolphins (or her) to another tank. In this logo, the orca, small in relation to the real world, but large in relation to the glass (tank) was leaping to depict Morgan leaping to freedom. Sadly, this has still to happen.